Speaking at the Likud convention in Tel Aviv, the prime minister added that political instability invariably leads to extortion and populism that harm security, the economy and society. “I will not allow a campaign of a year and a half that will harm the country,” he said. 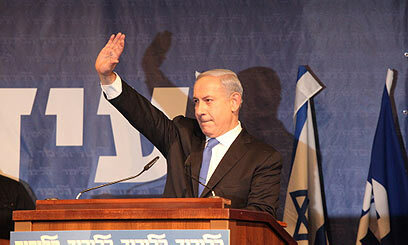 In a typical election speech, Netanyahu took a jab at his rivals, particularly Labor Chairwoman Shelly Yachimovich. “The State of Israel cannot afford to have a prime minister devoid of political, economic and security experience. That is the necessary combination,” he said. He opened his speech by thanking the citizens of Israel for their condolences following the death of his father Prof. Benzion Netanyahu. He listed his government’s achievements. “We have systematically hurt many of those who sought to hurt us. We both initiated and responded with determination to any attack. With the help of the Iron Dome system and the border fence we have proven we handle security with power and discretion,” he said. Addressing the Iranian threat, Netanyahu said that the world is standing behind efforts against the Iranian nuclear program, largely due to Israel’s activity. He pledged not to ease up on pressure before the threat is lifted. “There is much more that needs to be done in all areas, including replacing the Tal Law with a new bill that will divide the burden in a just and equal manner. We shall search for opportunities to promote peace with our neighbors and defend our people’s vital interests,” he said. Netanyahu was expected to be appointed convention president in order to approve a line of procedural changes in the party, but ultimately, and following a commotion involving Likud members, it was decided to not to hold the vote for the convention presidency on Sunday.